"We Believe Sports Should Be Accessible To All. We Didn't doubt We Would Get There"
Coach Paul (left) and son Jamie (right). Ian of Bristol Sports (Centre). Football coach Paul Griffin is one of those individuals whose energy, motivation and sense of fun through sport is almost contagious. He is committed to making sports accessible to all and Paul's many years of coaching at Longwell Green Sports JFC have shown him that there are some gaps in opportunities for children with SEND and disability needs when it comes to football. "There are few options in football so we wanted to create an inclusive provision to provide something for our community which maybe children didn't have access to before". Many of us can identify with the lack of availability and search for suitable groups and opportunities for our children. Paul Griffin is an FA qualified licensed coach and has picked up many awards for his voluntary work coaching to-date has volunteered 15,000 hours and counting! 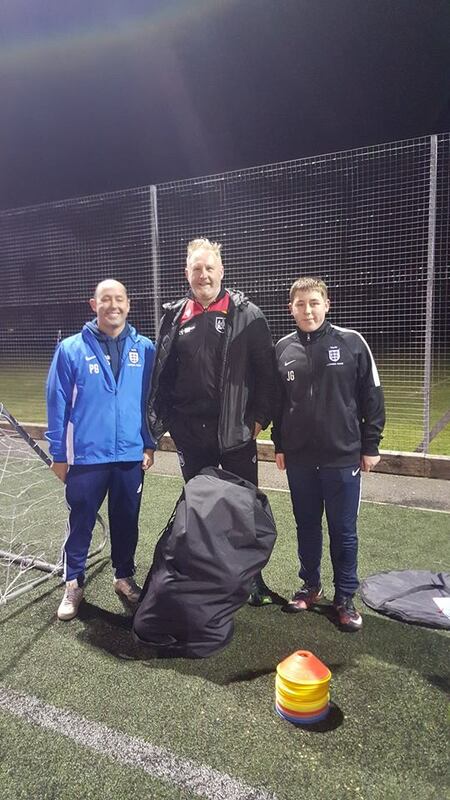 His son Jamie is 16 years old and is a FA qualified and licensed coach also. Amy Stilltoe is 18 and a volunteer working towards becoming a FA qualified coach and helps out at several football groups. If you have a child that is interested in taking part in football sessions get in touch with Paul to find out more via email: goaliegriff@tiscali.co.uk Everyone is welcome and all needs accommodated. Older PostDedication to Inspire. You Do How Much? We here at SGlosPC are trialling something new when it comes to being heard and making your views known. We really, really want to know your thoughts and views. We often get in touch with you about consultation events. As important and fundamental as they are, they can for some be offputting. They can come with many documents in Local Authorityese, a language not many of us are proficient in. Easy read versions might not be released and ready in time for the event you attend and they can for some be offputtingly formal or too structured and facillitated leaving little room for feeling like your voice is heard. That said, for others they are ideal . We had an amazing wonderful day and were touched by the number of our community that turned out to help us celebrate and eat cake! Not only did our community join us to explore the new community base and to give their great ideas on how they would like to see our community space used, we had a number of representatives from support organisations such as Supportive Parents and CONTACT and also team managers from some local authority teams such as Transitions and the 0-25 service who recoginise the work we do, how we have grown and what value we have in working co-productively with them to make posiotive changes for our community. The South Gloucestershire Children, Young People and Families Partnership have released the draft version of their Early Help Strategy for Children 2019 - 2024 for consultation and taking the views of South Glos residents, stakeholders and organisations. Did you feel the way we did watching episode 4 of the BBC2 documentary School? We cried tears of sadness and fear as we watched just 3 families within our community and their education struggles. We know this is just the tip of the iceburg as these scenarios are replicated 100s of times over throughout South Glos. Our Understanding and Supporting Behaviour workshop pilot was a great success! On Monday 19th of November we held the third of our pilot training workshops themed around behaviour. Our key message for the wonderful parents and carers who came is that all behaviour is a form of communication. All behaviour tells us of a need that is met if our child is calm and in a happy, feeling well sort of state or of unmet needs if they are reaching meltdown or entering shutdown. Join us at one of our Parent Carers SEND community meetings to hear more about the school budget consultation from the Council. Take care of yourself as though you are someone you are responsible for caring for. Get your FREE flu jab! Who cares for the carer? Have you considered what would happens should you go down with flu this winter? Not all carers are aware that if you receive carers allowance or are an unpaid carer for a person with disability or an elderly person, you are entitled to a free flue jab. You don’t know what you don’t know. So explore ahead of time what is out there. Sometimes in life, we find what we want by experiencing what we don’t like, or something that meets some of our needs, but not all. We realise what we truly want is a combination of all the good stuff we experience put together in a new way that makes us the most content we can be. We want to bin the Local Offer and start again. Who is with us? We know from what you have told SGPC, Ofsted and the CQC during last November's inspection that The Local Offer in its current form does not work for you and our community and needs to be done again. So lets bin it and start again! What is this Local Offer thing I have been hearing about? So what is this Local Offer thing I have seen posts and discussions about? During the Ofsted and CQC inspection of 2017, one of the biggest bugbears you told us and Ofsted was a lack of easy to access information on services and processes. The Local Offer is supposed to be the place where you can access all of that stuff. It is not very good in its present form and some of you don't know what it is, and its name doesn't make it obvious. Check it out here and challenge yourself to find the information that you need in an easily accessible format, if you are able to, you are better than we are! School and College Transport Stress-o-meter Survey. One survey and two minutes could make a hec of a difference. We know how stressful this is for families and especially how it can really cause or has caused already massive anxieties for our children. Newsflash! Our pilot Sensory Needs workshop was a great success! Sign up to our database to get emails about our first come first served workshop spaces covering topics such as communication, anxiety, managing behaviour and physical disabilities. We couldn't be more pleased with how our first workshop for parents and carers in South Glos went and are really looking forward to the next topics that we will cover. The parents and carers who attended were wonderful engaging with all the resources and sensory toy crafting activities and explorations. A helpful guide for holiday assistance, grants, equipment, mobility and more! Unhappy with the Local Offer? Want to help make it better and really work for SEND families in South Glos? Get involved! Keep an eye out for the dates for the consultation events and different ways in which you can give your ideas and feedback that will be coming in September 2018. NEWS FLASH: The EHCP Annual review process is being reviewed and we are there giving your views. South Glos Council are analysing and unpicking each stage of the process and we are helping. Sharing your views and perspectives with the services who need to hear. South Glos Parents and Carers have been attending meetings with Keith Thompson of the Department for Education and Paul Spencer of NHS England and the South Glos local authority. The purpose of these meetings is to monitor the written statement of action in response to the Ofsted and Care Quality Commission inspection. Amazing news! South Glos Parents and Carers Mapping Your SEND Journey workshops are coming! Book your space on the Understanding Sensory Needs workshop now! We have funding from South GLOUCESTERSHIRE council to design some workshops that are more specific to our families needs. This is a Pilot throughout 2018-2019 where we want to collect your thoughts. We have a fantastic Team of Parents and Professionals who are working together and writing this programme. THE WRITTEN STATEMENT OF ACTION FOR SEND, CHANGES IN THE STRUCTURE OF THE 0-25 SERVICE; SOME OF YOUR QUESTIONS ANSWERED. Peter Murphy ( South Gloucestershire Council) and Deborah El-Sayed ( Bristol/ North Somerset and South Gloucestershire Clinical Commissioning Group) have released a statement of action - what they will do - in response to the area SEND inspection so many of you took part in, November 2017. NEWS FLASH: Results from the short breaks survey you participated in! In September and October 2017 we began working with the local authority to get feedback from our community on short breaks. Many of you responded to our online survey giving your honest feedback and expressing what you would like to see from the short breaks service. We want to thank all of those who took the time to contribute and we will continue to push to work co-productively with the local authority in this area. The full report on the findings of the survey has just been released. NEWSFLASH: New SEND Strategy is now live and available online! The results of your amazing contributions, read it here! So many of our community contributed to the SEND strategy participation work we had carried out, attending meetings or having filled in surveys online. Thank you so much for taking the time to express your views and thoughts on what the local authorities' SEND priorities should be over the coming 5 years. Whether you are starting your parent carer journey or preparing for adulthood. We can SEND you on your way with our new guides! Our guides are created by our community of Parent Carers on their own SEND journey. We never stop learning and we want to share what we have learnt along the way. Our guides are a gift to our community to help other families feel more informed and less isolated and a bit more in control. You can get FREE copies by becoming a member (for free) just by joining our database, you will be sent a copy of their release. We are working behind the scenes on a new way to support the community that we hope will increase our community's opportunities to get face to face support, information and resources. Whats on at our support groups ? Quick! Do you have an interest in the needs of children, young people and young adults with Special Educational Needs and/or Disabilities (SEND) in South Gloucestershire? If the answer is yes, the draft strategy is now ready for anyone to give their views on. With Pablo, a Cbeebies character who thinks differently and sees the world in different ways, anything can really happen - even being famous on the telly for a day! Area SEND Inspection starting 6th Nov.
News Flash - Would you like a Special Needs Free School in South Glos? New Siblands and Culverhill Schools want to join together and form a new special school Multi-Academy Trust in 2018 called Enable Trust. Enable Trust wants to win the right to open and run a new Special Free School in South Gloucestershire. They would like to find out if there is an interest amongst parents and carers for such a school in the area. We have been on quite a journey since we first started in 2009 as 8 parents meeting in a cafe wondering how we can support one another and make a difference and positive change for our children and young people with special needs and disabilities. We are so proud in 2019 to be opening our first community base where our wonderful community of parents and carers can come on a weekly basis during term time for information, advice and support, or even just a cuppa and a conversation with another parent carer who gets it. We share the highs and the lows, the joys and the challenges of disability parenting. There really is nothing like walking into a space where you can relax and know that you are understood. Little Treasures is a parent-led play and support group for babies to preschool children with additional needs, their siblings, parents or carers to come together. We provide a suitable and stimulating environment for any child's needs. We also offer a healthy and tasty snack for the children and tea and coffee for the adults. If you would like to get in touch to discuss your child's needs and find out more, please email: team@sglospc.org.uk or look here. Car Park can be accessed by Wesley Avenue, Hanham. Pop in for a cuppa and chat with other parents and carers. Share experiences, and pick up tips from each other. There is no need to book, just show up and feel free to bring a friend if you like. Community Interest Company (not for profit) 8364673. Copyright © South Glos Parents & Carers 2018. Web design by Manage My Website.